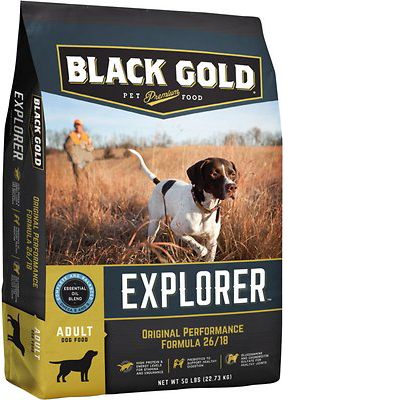 Black Gold Explorer Original Performance Formula 26/18 is an overall below-average quality dry dog food at a low price. This product, unfortunately, uses 5 controversial ingredients, including an artificial preservative. The food also has a somewhat high amount of carbs compared to its protein and fat but overall good meat and fat quality. On the positive side, Black Gold has had no recalls and the company was also very transparent when answering our questions. This food has a fair amount of protein and fat but is somewhat high in carbs, which is lowering the total protein and fat content slightly, and making it less nutritionally balanced compared to other dog foods we evaluated. Carbohydrates are cheap so they keep the food’s cost low. They are nutritionally useful to dogs in the right amounts, however, high amounts of carbs can reduce the much-needed meat-based protein and fat content. Beef Meal, Corn Meal, Ground Wheat, Corn Gluten Meal, Chicken Fat (Preserved With Mixed Tocopherols And Citric Acid), Brown Rice, Dried Beet Pulp, Chicken By-Product Meal (Source Of Glucosamine And Chondroitin Sulfate), Natural Flavors, Brewers Dried Yeast, Potassium Chloride, Salt, Malted Barley, Dried Chicory Root, Vitamins (Vitamin A Supplement, Vitamin D-3 Supplement, Vitamin E Supplement, Niacin, Calcium Pantothenate, Riboflavin, Pyridoxine Hydrochloride, Thiamine Mononitrate, Menadione Sodium Bisulfite Complex (Source Of Vitamin K Activity), Folic Acid, Biotin, Vitamin B-12 Supplement), Choline Chloride, Calcium Propionate (Preservative), Minerals (Zinc Sulfate, Ferrous Sulfate Monohydrate, Copper sulfate, Manganese Sulfate, Calcium Iodate, Sodium Selenite), Saccharomyces Cerevisiae Yeast Culture, Dried Enterococcus Faecium Fermentation Product, Dried Lactobacillus Acidophilus Fermentation Product, Dried Aspergillus Niger Fermentation Extract, Dried Trichoderma Longibrachiatum Fermentation Extract, Dried Bacillus Subtilis Fermentation Extract. The average dog food we reviewed has 32 total ingredients, with 1 controversial ingredient. This product has 5 total controversial ingredients and 3 of them are used in the first five ingredients. This is concerning because the first 5 ingredients make up most of the product. Dog food ingredients are listed in descending order of weight. So when looking at a dog food label, take a close look at the first 5 ingredients. They generally make up about 80% of the total weight. Corn meal (also known as corn flour) is ground dried corn. While it provides protein, corn meal is less nutritious than meat (its ability to provide amino acids to your dog's body is lower). Therefore, we do not consider it a high-quality dog food ingredient. Chicken fat is the fat left over after cooking chicken parts. It's a high-quality dog food ingredient that provides nutrients such as fat and Omega-6 fatty acids. Mixed-Tocopherols are a natural preservative made from Vitamin E that helps keep food fresh. We consider it a high-quality dog food preservative. Citric acid is a natural ingredient found in citrus fruits. It can also be made from corn and mold. It's used as a natural preservative and is generally a healthy dog food ingredient. Corn meal is a lower cost ingredient that does provide energy, but dogs can be sensitive to. As a kernel it is not digestible, so it must be processed, but that processing leads to a higher glycemic index. Corn meal is not generally considered a controversial ingredient, but is controversial if it is used in the top five ingredients (which make up about 80% of the food's weight) where a named meat would be more nutritious. Ground wheat is not simply good or bad. It' provides calories and carbs, but some dogs can have a sensitivity to it. Wheat is not generally considered a controversial ingredient, but is controversial when it is used in the top five ingredients (which make up about 80% of the food's weight) where a named meat or lean protein would be more nutritious. Corn gluten meal is a low-cost protein ingredient that is used to add protein and bind food together. This protein is far less complete in nutrient content than meat-based proteins, but because of its lower cost, it is often used to bump up the protein percentage. It is controversial if it is used in the top five ingredients (which make up about 80% of the food's weight) where a named meat or lean protein would be more nutritious. Calcium Propionate is an artificial preservative that helps slow and prevent mold. Chronic exposure has been linked to headaches as well as behavior changes in children that include irritability, restlessness, inattention and sleep disturbances. lack Gold products are manufactured in the United States. The meat and fat quality of this product are overall good, with clearly identified animal sources (for example, Beef Meal, Chicken By-Products and Chicken Fat). The top meat ingredient beef meal is a good source of nutrient-dense animal protein, but further down on the ingredient label is “chicken by-product”. The word “by-product” indicates that these are the non-meat parts of the chicken, this could be organs, blood, bones, fatty tissues and more. The questionable part is that because the word “by-products” isn’t specific we don’t know exactly what is included in that ingredient. Another thing to note is the high content of corn meal and corn gluten meal. These two ingredients can be used to increase the protein content without adding meat-based proteins, seeing both of these as top ingredients lead us to believe the meat content is quite low. This being said, Chicken Fat is listed as a fat source pretty high up on the ingredients list, so that’s a plus. This product contains the controversial preservative Calcium Propionate. While not all artificial preservatives are bad, we do consider 11 artificial preservatives as controversial because of their potential link to cancer and other serious health conditions. Unfortunately, Black Gold uses one of them in this food. This product does not use any artificial colors. This product does not use any artificial flavors. Very positively, we did not find any dog food recalls for Black Gold. We love dog food brands that are committed to transparent business practices. If you make quality dog food you should be willing to openly talk about how it’s sourced and produced. That’s why we reached out to each pet food company, asking questions about all their brands and products. Each company had three weeks to reply to our messages. ‍Black Gold was exceptionally responsive to our first email. They were one of the few companies who responded within 1 day, and with relatively complete answers. There was a 2nd email to ask for the nutritionist's name, but they stated that they are unable to provide names of employees. The name could not be shared. It gives us a lot more confidence in a product to know excatly who is making the food.